Over the past couple of years, I'm sure I've frustrated many of my readers who have asked me the question, "What trading books do you recommend?" I've simply never had an answer. Reading trading books never interested me. I had skimmed a couple, but for the most part, I felt like I would just be wasting my time. My thinking was that I would rather spend my time learning by watching the market than from outdated info in a book. Sure, reading the stories of billionaires on Wall Street could be interesting, but there was no way I could relate to that or use it to make myself a better trader. By the time I even knew trading psychology books existed (one of the only categories that I think could be useful), I was already quite successful and felt like I didn't need them. 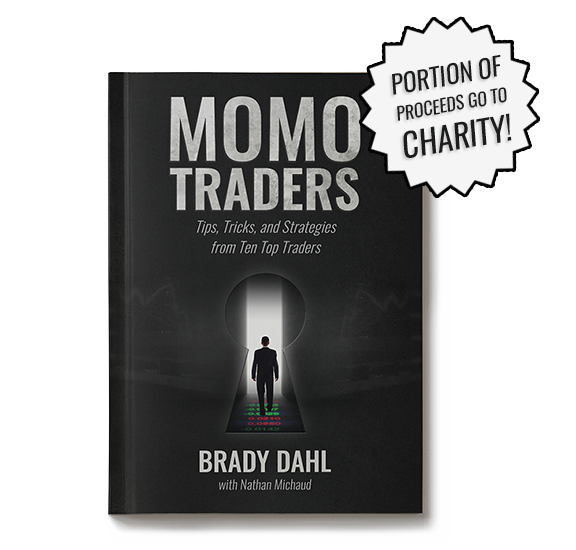 In late 2014, Brady (@MiltonaTrades) and Nate (@InvestorsLive) approached me and asked if I would be interested in being one of ten traders featured in their upcoming trading book, Momo Traders. The book would be written in a question/answer interview style and explore the path each individual trader took to eventual success, as well as the many lessons they learned along the way. I loved the idea and agreed to be interviewed, which turned out to be one of the most intense interviews I have ever participated in. The Skype interview took almost three hours to complete, but left me feeling great about the quality of information I had shared, and I was incredibly excited to read the interviews of all of the other traders who had been featured. In my mind, I was (and still am) a small fish compared to some of these traders, who make millions of dollars per year. Like myself and everyone else, they had all started as beginners once, with much less money to their name, and I wanted to read about their journey and learn everything I could from them. Now, a year later, Momo Traders has finally been released. As I had hoped, the stories inside are absolutely incredible. When you see these traders posting screen shots of their massive profits now, they don't seem human. However, to read all of their stories, hear about their early struggles, and learn that they came from the same place that you did, is incredibly inspiring. No two stories or strategies are the same. So I would suggest that you really take your time while reading each chapter, maybe read just one or two chapters a day like I did. Another big perk to Momo Traders is that a portion of the proceeds goes to charity! Not only are you investing in your education, you're contributing to a good cause! There is SO MUCH to learn from each one of these traders, so I highly recommend you pick up your copy on Amazon or at momotraders.com. It's a very inexpensive investment towards your education, and you can learn how these ten traders, who were once beginners too, became the millionaires they are today. Hey Tim it's Raidon from Challenge chatroom! I'll buy this book as soon as my salary comes in 5 days! Right now i'm reading the Trading for a living, i've another psychology book to read too. But this one is my next one to read, thanks Tim! Hey tim, I know you post what you are watching on twitter, but is there anyway you can post what stocks or penny stocks you are going to buy 100% and tell if you will short sell or keep it for the long.